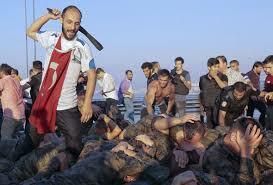 Erdogan shamelessly fed conscripts to his rabid dogs. The rule of law does not exist in Turkey. And the stability that once existed is also gone. After Erdogan pulled off his power move and succeeded, even getting backing from international powers, the country is fast descending into chaos. The fascist Islamists are on the rise as they appear to be taking the gloves off against minorities, opposition parties, and anyone who does not bow to Erdogan. Members of Erdogan's Islamist party, the AKP, and the pro-Erdogan police force are attacking Alevi and Kurdish neighbourhoods for a second straight day. Things could escalate very quickly, especially since Erdogan has let his rabid dogs off the leash, not worrying about the long-term repercussions. Pro-regime Islamist groups have also attacked the headquarters and offices of the Kurdish HDP party, which took a principled anti-coup stance on Friday night. It looks like Turkey is going down the road of civil war and heavy police state repression. The Southeast of the country is no longer the only war zone. Erdogan will draw on his plethora of Jihadist terror groups to impose his will on the country and put fear into citizens. How can the international community condone Erdogan's actions? And how absurd is it that a NATO ally is barbecuing its own soldiers and relying on ISIS terrorists to impose order? This is backfiring on Kurdish & Alevi minorities, as always. Islamist mobs reported attacking Kurdish & Alevi neighborhoods of Istanbul.